The invasion of the Rhen has begun! Darien Lauchlin is determined to find a refuge for the people of Malikar by any means necessary—even if it means conquering the nations he formerly swore to protect. Wielding the most powerful magical talisman known to man, Kyel Archer stands opposed to him. And there could be no higher stakes—the reversal of the magic field is only weeks away, heralding the destruction of all the world’s mages and the long legacy of magic. Only one side of the War for the Rhen will emerge victorious, and the survival of an entire population hangs in the balance. Darkfall is the fourth and final novel of the epic fantasy series The Rhenwars Saga. If you like morally gray heroes, page-turning action, and mind-boggling plot twists, then you’ll love Spencer’s award-winning series. A fitting end to a thrilling series. Loyalties are tested and characters are pushed to the limits of their fortitude and resolve. Time and again, Darien's fate has been fraught with hard choices. In this final installment of the Rhenwars Saga, everything is at stake—the fate of the world, the fate of the magic field, the fate of the Well of Tears, and the fate of Darien's soul. How much strife can a man endure before becoming vengeful and evil? At what point will Darien break? Darien has been willing to go through almost any means to reach an end he sees as righteous, often with honorable ideals in mind, though not always honorable in method. In this volume, we see a clear contrast to Darien through the character of his former acolyte, Kyel Archer. Kyel has long been a voice of reason, unwilling to compromise his integrity and forever optimistic in his worldview. Where Darien leans toward isolation and distrust of others, Kyel upholds a sense of reliance on the goodwill of those he works with. These two dichotomies play against each other remarkably well here, where the inherent advantages and disadvantages with each stance inevitably play out, with sometimes shocking results. I do think this book would benefit from one more round of line editing. There were no glaring errors, just a bit of repetitive word choices that were sometimes distracting. The epilogue was the absolutely perfect way to close out the series, and to me came across as extremely poetic. I want to thank the author for the focus and dedication exhibited throughout the series and building into its conclusion. I have nothing but high praise for this extensive endeavor. Thank you for this world, for its villains and heroes, its pain and its beauty, and for bringing all of it to life for readers. 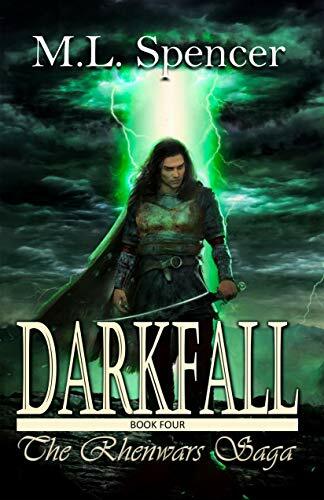 Darkfall can be found here on Amazon and here on Goodreads.